We have affordable online credit card calculators to add to your site. Your visitors can see how long it will take to pay their credit card bill and the interest amount they pay when they make only the credit card minimum payment each month. Don't believe it takes that long? The proof is in the amortization table, which all of our calculators offer, when applicable. Compare minimum credit card payments to equal payments and see the interest on credit cards drop dramatically. Use one of the payoff by time calculators to set a payoff date and get the monthly payment amount required to meet that goal. Find these calculators, with full amortization schedules, and more, right here! See if there's a credit card calculator you can add to your site that will help your visitors. Better yet, add our entire group of credit card calculators at a very reasonable price! Just click the shopping cart by "Credit Card Calculators" to subscribe to the whole group, or click the shopping cart by a specific calculator name to order just that one. If you can copy and paste a link to your site, you can add as many credit card calculators as you need in just minutes. Coming Soon! These calculators will be added to the Credit Card Calculator Group soon. Remember, if you subscribe to the Credit Card Calculator Group now, you will get these new credit card calculators free when they are released. Vote for the one you would like us to do next or something completely different. Also available: Not looking for a Credit Card Calculator? Maybe what you need is in one of these groups instead. Not looking for a Credit Card Calculator? 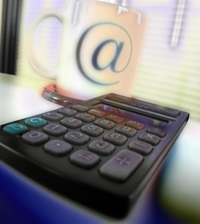 Check out our full list of online calculators. How long will it take to pay off my credit card balance if I pay the same amount each month? If you want to eliminate that credit card balance, you'll probably want to pay more than the minimum required each month. Enter your credit card balance, interest rate, and the amount you will pay each month and this calculator will show you how much interest you will pay and how long it will take to pay off your credit card. Show the amortization schedule to see the month-by-month payment breakdown. How much over the minimum should I pay each month to pay off my credit card balance in a certain amount of time? Enter all the information about your credit card terms and the number of years and/or months you would like to have this card paid and this calculator will show how much additional you will need to pay each month (over the 'Payment Due' amount on your credit card statement) in order to meet that payoff time. Your payment will still be based on the minimum payment amount so it will still change each month. You will simply pay the same additional amount with each payment you make. How much should I pay each month if I want to pay off my credit card balance in a certain amount of time? Enter the loan balance, interest rate, loan length, and monthly payment and this calculator will analyze your loan. You will see how long you've been paying and how much you've paid to date on your loan, as well as how much time is remaining and how much more is to be paid.Just enter your loan balance, interest rate, current monthly payment, and the additional amount you will pay each month and the calculator will compare the payoff time and interest charges for the remainder of the loan. How much of my credit card limit am I using? Use this calculator to figure your balance-to-limit ratio or what percentage of your available credit card debt you are actually using. A low balance-to-limit ratio indicates you use your available credit wisely, which is important to lenders and plays a significant part in credit risk scores. In general, it is better to leave credit card accounts open if you have zero balances than it is to close them, especially if there is no negative activity associated with the account. That's because for each zero balance credit card account you close, your balance-to-limit ratio goes up, and it suddenly looks like you may be overusing your credit. Unused credit results in a lower balance-to-limit ratio. How much interest am I paying each day on my credit card balance?